I love Chicago, and I don't know why I don't visit more often. My trip last week was somewhat crazy because I had to juggle the conference and hanging out with some of my favorite people (old friends from grad school who have graduated and moved elsewhere, as well as friends from college who now live in Chicago). And, on top of that, I was on a mission to enjoy the food. The first night I was there, I was explaining to a few friends that I wanted to go to Frontera Grill (one of Rick Bayless's restaurants). All I got out of my mouth was "three restaurants together" and my other friend, Sam, turns around and says, "Are you talking about Rick Bayless? We're planning to go to Frontera on Tuesday and you should come." There's a reason that Sam and I get along so well. So, after several agonizing days, we finally made it to Frontera for lunch. Let me just say that it was worth the wait. It would have been worth the four hour drive to Chicago just to eat there. There were noises emanating from our table that I've never heard before... at least not in a public place. The menu changes every month, and Sam and I are already talking about making a trip to try the November menu. It started as a joke, but I think that both of us are somewhat serious. After Frontera, the next stop on my food journey was The Spice House. I've been wanting to go there after reading Kalyn rave about it a few months ago. I would have also liked to take a trip out to Penzeys, but didn't have the time to get out to the suburbs on this trip. The Spice House was wonderful, and I was surprised that everything was very affordable (for quality spices, that is). I restrained myself from buying too much, but did get some rose water, sumac (I can't wait to try Kalyn's Chickpea soup), and their Greektown Billygoat seasoning blend that Lydia recommends (I love this stuff - I've used it on chicken, fish, and veggies already). To my surprise, Old Town Oil is right next door to The Spice House, so I had to duck my head in there. Oh. My. God. They have all kinds of oils and vinegars, and you can taste them all. Boy did I take advantage of that. I wanted to buy just about everything that they had, but finally settled on walnut oil and strawberry balsamic vinegar. There are going to be a lot of amazing salads in my near future. I also visited the Green City Market on Wednesday morning. No matter where I am, I have to visit a farmers' market. Even if I can't buy anything, it's fun to visit, and I learn a lot about the city. I picked up some apples (from Michigan, of course) for the trip home, and also some Japanese sweet potatoes. I love sweet potatoes, so I was excited to try a new variety. They're a vibrant red on the outside, with a white interior that turns yellow soon after they're cut. I mentally wrestled with how I would prepare them, and finally decided to combine two dishes that I've enjoyed in the past: sweet potato and black bean hash (which I adapted from "Moosewood Restaurant New Classics") and sweet potato aloo gobi (from Dinner with Julie). The result was delicious. I should have bought another one of these sweet potato so that I could directly compare it with a "normal" one, but the main difference that I noticed is that these are starchier and didn't have as much moisture as other sweet potatoes. 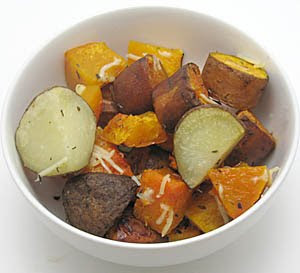 I enjoyed the flavor of them in this dish, but regular sweet potatoes would work beautifully as well. Heat oil over medium heat in a very large skillet. Add onion and cook until tender. Then stir in garlic, cook for an additional minute, and add sweet potatoes. Cover the skillet and cook for 5 minutes until sweet potatoes begin to get tender. 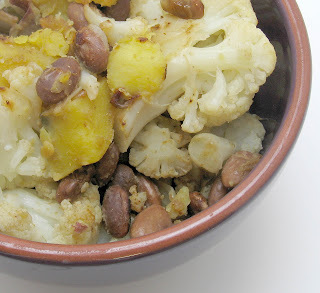 Then add jalapeno, cauliflower, cumin, and salt, recover, and cook for another 5 min. Stir in beans, and continue to cook, covered, until sweet potato and cauliflower are soft (about 10 more min). Serves 4. As soon as I got back from Chicago last week (more on that in the next few days), my friend Katie (yes, it gets confusing) sent me this message: "Now that you're back, you should roast some squash and stuff it with quinoa, garlic, tomato, and cheese. Dan just did this and it is blowing my mind! Gluten-free, delicious-full." Over the many years that we've been friends, we've shared many great food experiences and I definitely trust her taste buds. Ok, so perhaps regularly consuming an entire Hungry Howie's pizza between the two of us doesn't qualify as a "great food experience" to some, but it always seemed like a good idea at the time (who am I kidding, it would still be fun if it wouldn't make me sick). So, I used Katie's suggestions with a few tweaks here and there, and it blew my mind too. She said that Dan used delicata squash, but I had an acorn squash lying around calling out to be stuffed. I'm sure that any winter squash would work, so use your favorite. I also added some kale because I had a bunch that needed to be used. I'm submitting this to Weekend Herb Blogging, which I'm hosting this week. Haalo from Cook (almost) Anything At Least Once organizes this event, and check out the rules so that you can participate too. Send me those entries!! Place squash cut side down in a small baking dish. Bake at 400 until the squash is tender (about 40 min). While squash is cooking, heat oil in a large skillet over medium heat. When oil is hot, saute garlic, basil, oregano, rosemary, and red pepper for a minute or two, until they're very fragrant. Then add kale, toss well, and cook until kale is tender (about 5 min). Add tomatoes and salt and cook for another minute or so. Stir the cooked quinoa into the kale and tomatoes, and then flip the squash over and stuff it with this mixture. Top each half with 1 Tbsp cheese and then bake at 350 until the cheese melts (5-10 min). Serves 2. I realize that last time I did a CSA round-up, it sounded like it was my final share. I really meant 'last' as in previous, not final. 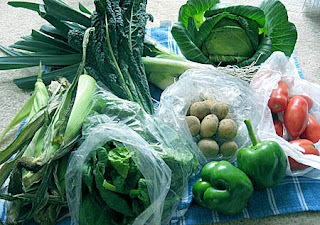 But, this post does wrap up the end of my CSA. Several weeks ago I picked up share #9, and selected corn, spinach, potatoes, green peppers, tomatoes, dino kale, leeks, and cabbage. It's so strange seeing tomatoes and corn right now, and hard to believe that I was enjoying them just a few weeks ago. 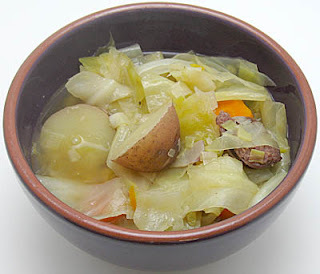 I used the leeks, potatoes, and cabbage to make another batch of cabbage, potato, and sausage soup (I told you I loved it). I ate the spinach and green peppers in several salads. I received my final share early because of my trip to Chicago last week, and came home with sweet potatoes, eggplant, peppers, carrots, broccoli, leeks, brussels sprouts, and cabbage. I ate the carrots for a snack, roasted the brussels sprouts, and sauteed the eggplant with a bunch of other veggies. It's really sad that my experience with Titus Farms is over. If I were planning to live in Michigan next year, I would sign up again in a heartbeat. They are planning to have a winter CSA next year, and I'm jealous of everyone who will be able to enjoy even more of their delicious produce. I just hope that I'll have good CSA options wherever I end up next year. Did anyone else have a great first CSA experience? During the fall and winter, there's nothing I crave more than roasted vegetables. Part of the reason that I enjoy them roasted is that turning on the oven (at a fairly high temperature, no less) does a very good job warming up my apartment. I haven't yet turned on my heat, so my oven has been getting quite a workout lately. The great thing about roasting veggies is that you can throw together just about anything and it works. I happened to have several butternut squash that my parents brought from my grandparents' garden several months ago (I was in denial that fall had arrived for some time, and refused to eat winter squash). I combined that with sweet potatoes from my CSA share and a few potatoes that I bought at the market last week. It was fabulous. These sweet potatoes are some of the best that I've ever had, and I'm hoping to stock up before the market ends next week. 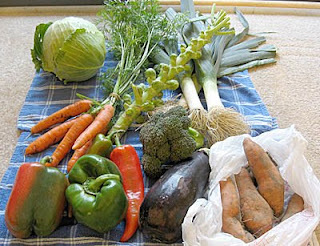 Feel free to throw in other veggies, such as carrots, parsnips, turnips, other types of winter squash, etc. Peel the squash with a vegetable peeler, and cut it in half. Remove the seeds and stringy membrane, and then cut the squash into bite-sized pieces. Combine the squash and the potatoes on a large baking sheet (I line mine with foil to make clean-up easier). Drizzle oil over the veggies, and sprinkle with salt and herbs. Toss the veggies well so that everything is covered in oil, and then roast at 425 for 30 min. 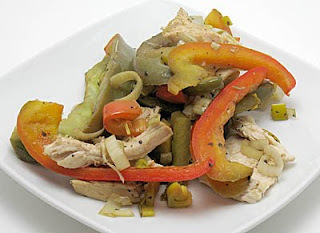 Stir the veggies and continue to cook until everything is very tender (15-30 more min). Sprinkle with parmesan if desired. Serves 5. When I first told my long-time gluten-free friend about my gluten woes, she insisted that I make millet cakes. I had actually bookmarked a millet cake recipe a few months before, so I assured her that it would be happening soon. It's taken me a while, but I finally got around to it tonight, and I wish that I hadn't waited this long. She definitely knew what she was talking about. I knew that these were going to be good when I tasted a little bit before letting the mixture cool, and it was better than some of the best risottos I've ever had. It was slightly lemony, slightly cheesy, comforting, and absolutely amazing. After I made it into cakes, though, it was even better. The slightly crispy outside of the cake was perfect with the smooth interior. They take a while to make, but there's very little hands-on time. And hey, if you just can't find the time to wait for the mixture to cool to make the cakes, then at least enjoy a nice millet "risotto". Heat 1 Tbsp oil over medium heat in a medium saucepan. Add the onion and saute until tender. Then stir in the garlic and millet, and cook an additional minute. Add broth, bring to a boil, reduce heat, cover, and simmer for 20 min. Stir in remaining ingredients, and let simmer uncovered for 10 min, stirring occasionally. Then remove the pot from the heat, cover, and let stand for 10 min. If you want a risotto-like dish, stop here and enjoy. To make the cakes, remove the lid of the pot and let the mixture cool for 30 min. Once it's cool enough to handle, form it into 6 patties (about 1/2" thick), and refrigerate them for at least 20 min. Then heat the remaining oil over medium heat in a large skillet. 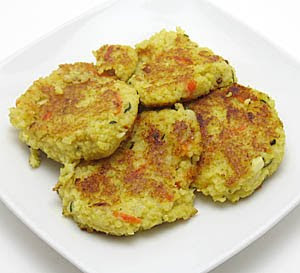 Cook millet cakes until nicely browned (about 5 min on each side). Serves 3. I'm scienced out. We're only in day 2 (of 5) of the Society for Neuroscience conference in Chicago, and I can barely keep my eyes open. I think that just watching 30,000 people wandering around is enough to make me tired. I remember having more stamina in previous years, and I'm hoping that a brief "lunch" break will rejuvenate me. (Lunch is a joke, as all they seem to have in the building is sandwiches, pizza, and churros. Well, except for the $1.39 apples.) So, to let my mind wander in a different direction, I'm going to share one of my favorite ways to prepare cabbage. I love roasted cabbage, and it couldn't be easier to make. I never knew that cabbage could be so sweet, but this convinced me. I also love the way that it crisps up and becomes almost chip-like (similar to kale chips). My occasional (or constant) craving for chips is almost satisfied by roasted cabbage, yet there's absolutely no guilt afterward. Cut the cabbage into 8 wedges (or more or less, depending on the size of your head), and spread them out on a baking sheet. Drizzle with olive oil and sprinkle with salt and pepper. 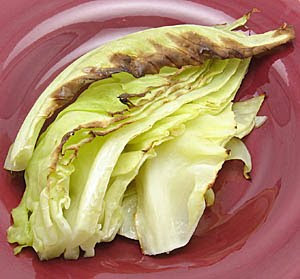 Roast at 450 for 20 min, then stir cabbage and roast for an additional 10-20 min, until the edges are brown and crispy. Serves 3-4. Desperate Dinner was one of the highlights of my first couple of years in grad school. It started a couple of months before I moved to Michigan, and I quickly joined in once I got here. A group of students in my program would gather every Sunday night, eat dinner together (there was a rotating schedule for cooking), and watch Desperate Housewives. About ten people showed up each week, so it wasn't too overwhelming to cook for everyone... that is, until the group grew exponentially. At some point things got out of control and we had 25 people showing up each week. And cooking for people's dietary needs/desires was quite a challenge (we had vegans, vegetarians, and carnivores, along with people who wouldn't eat sugar, eggs, mushrooms, tomatoes... and the list goes on). Plus, even if you managed to avoid all of those things, transporting that much food was quite a feat. On one dreadful occasion, I was trying to carry too many things at once and ended up dropping a huge dish of spinach and artichoke dip in the hall outside of my apartment. (It baked into the carpet and, 3 years later, I still get a kick out of hearing visitors ask whether it's vomit.) We quickly switched to a pot-luck style. Even then, we couldn't sustain the gathering. It was overwhelming and, understandably, nobody wanted to host that many people every week (and most of us didn't have nearly enough room). I was sad to see it go, but it also came at a time when I could easily occupy my Sunday night with other things, either research or softball. Recently, a different group has initiated Sunday night gatherings (minus the "desperate"). I've only been able to go once, and it's hard to tell if it will last. For now, I'll enjoy it while I can. Last week's theme was pizza. The host made a bunch of dough and pizza sauce, and everyone else brought a pizza topping. I was excited because it was the perfect opportunity to make a gluten-free crust. But then life got in the way, and I ran out of time and energy to make a real dough. Luckily, I remembered a recipe for a potato crust, and I got to work. I loved this crust. It was simple, and was a crispy base for my favorite pizza toppings. I highly recommend this crust even if you can eat gluten, and I saw several of my friends eying my pizza as they waited for theirs to cook. (Don't worry, they were in good hands because our host made my former favorite whole wheat pizza dough from 101 Cookbooks.) I still want to make a crust with gluten-free flours, but this was a fabulous alternative and I didn't miss out on anything that night. This is a great way to use potatoes, so I'm submitting this to Weekend Herb Blogging, which is organized by Haalo from Cook (almost) Anything At Least Once, and is hosted by Cinzia from Cindystar this week. Put the potatoes in a colander, sprinkle with salt, and let sit for 10 min. Then press as much moisture as possible out of the potatoes. Combine the potatoes, egg, and onion in a small bowl. Lightly oil a pie pan, and press the mixture into the bottom. Bake at 400 for 20 min, then spritz with olive oil and bake an additional 10-15 min (until crust is nicely browned). Makes 1 individual pizza. 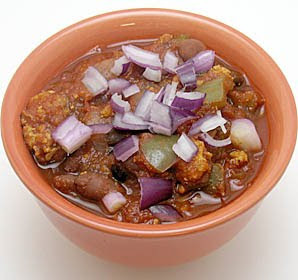 Chili is my ultimate comfort food, probably because my mom made chili frequently when I was growing up. Sometimes it was by itself and sometimes it topped a baked potato, but either way I always loved it. We always used one of those chili seasoning mixes (sorry to reveal your secrets, Mom! ), and I even did this throughout college. What were we thinking?? It's so easy (and much cheaper) to add you own spices, and then you have complete control over the taste. This was somewhat different than what Mom used to make (I used turkey instead of beef, and a blend of beans), but the overall taste was very similar. It was perfect for a cold day when I was stuck inside working. Next time I may add a little bit more chili powder because I like to end up with a runny nose and watery eyes when I eat chili. This will depend on your chili powder, so taste it before you dump a ton in there. Oh, and when I make chili, I make a LOT of chili. I never get tired of eating it, and it also freezes well. I don't quite understand the concept of small batches, but adjust as you see fit. I'm submitting this to My Legume Love Affair, which is organized by Susan from The Well-Seasoned Cook and is hosted by Jeanne at Cook Sister this month. Brown turkey in a large pot over medium heat, breaking it up as it cooks. Once turkey is browned, push it to the sides of the pot and stir in the onion and bell pepper and let cook until veggies are tender (about 5 min). Add the garlic, chili powder, cumin, ancho chile powder, and oregano and cook another minute. Dump all of the tomatoes and beans into the pot and season with salt. Bring the chili to a boil, then reduce heat, cover, and let simmer for about an hour, stirring occasionally. 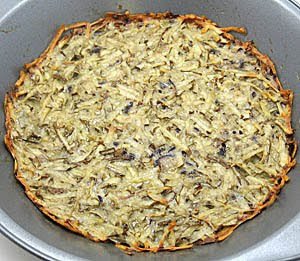 Garnish with onion (or cheese, sour cream, or anything else) if desired. Serves 8. I think I inherited my love for tortillas from my dad because he has totally abandoned bread in favor of them. I will never let go of my bread (even if it can't contain wheat), but tortillas make such a good alternative from time to time. I've been meaning to make tortillas, but that's one of many things that I've put on the back burner lately. One day I'll get around to it. To keep me satisfied, I picked up a package of brown rice tortillas a few weeks ago. 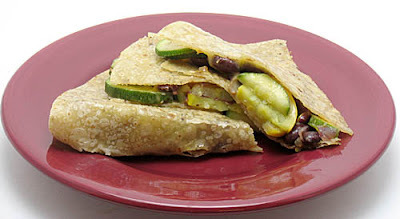 Although I ate a few for snacks, I made sure to save some for these bean and veggie quesadillas. I really enjoyed these, and I loved that I could saute the veggies ahead of time and cook a fresh quesadilla in no time flat. Unfortunately this will probably be my last zucchini recipe for a while, as I think it's officially gone from the market now. I meant to freeze some, but I never found the time or the extra freezer space. The upside is that I will appreciate it even more when it appears next year. Heat oil over medium heat in a large skillet. Add the onion and saute until tender, then stir in garlic and cook another minute. Stir in mushrooms and zucchini and saute until they're both tender. Then add beans and cook a few more minutes, until beans are warm. Place 1/2 tsp butter in a large skillet and melt over medium heat. 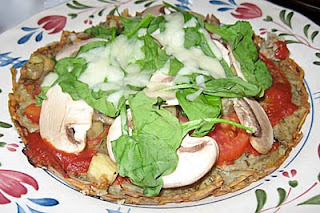 Place one tortilla in the skillet and add a quarter of the veggie mixture and 1/4 cup cheese on one half of the tortilla. Fold the other half of the tortilla on top of the veggies, and then cook until lightly browned on both sides (about 2 min per side). Repeat with the remaining tortillas, adding more butter when necessary. Serves 4. I picked up a spaghetti squash and an acorn squash at the farmers' market last week intending to combine them with one lucky member of my heaping butternut squash pile to make a soup. Then I remembered that all I've made lately is soup, and figured that I should venture out from my liquid realm. 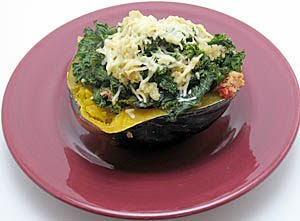 So, I began searching for spaghetti squash recipes. Many looked good, but I wanted something that could be a filling main dish. When I discovered Karina's recipe, I knew that I had the answer. 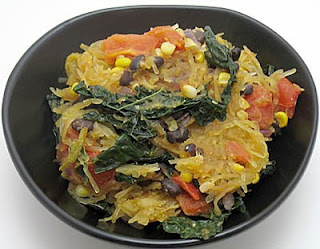 This is a fabulous way to make spaghetti squash. Sure, it's good as a simple pasta substitute, but this recipe far surpassed that. I added some kale because I had some lying around, and it was perfect in this (apparently I'm over my kale burnout from the spring). It makes a good meal, but has also served me well as a snack. I'm submitting this dish to Weekend Herb Blogging, which is organized by Haalo from Cook (almost) Anything At Least Once, and is hosted by Susan from The Well-Seasoned Cook this week. Cut the spaghetti squash in half lengthwise (I've heard that this is much easier if you microwave it for 5 min, and I plan to try this method next time). Put the squash halves in a large baking dish (cut side up) and drizzle them with olive oil and sprinkle with salt, cumin, and chili powder. Bake them at 400 for about an hour, or until the flesh is very tender when you stick a fork in it. When they're done, let them cool down a bit. While squash is cooling, heat the oil in a large skillet over medium heat. Saute the onion, garlic, corn, cumin, and chili powder for a few minutes, until the onion is tender. Then use a fork to scrape out all of the squash flesh, and add this to the skillet along with the kale, tomatoes, beans, and chiles. Stir well, cover, and let this cook for about 10 min (or see Karina's instructions for baking it). Stir in lime juice before serving. Serves 5. I warned you that I'm obsessed with black beans. In fact, I cooked up a bunch of dried beans yesterday and froze them in can-sized portions, so brace yourself for a plethora of bean recipes. 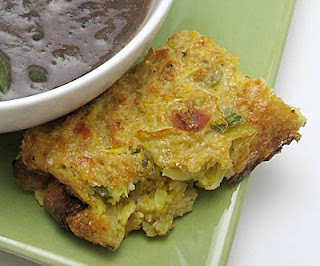 I've been meaning to make this soup ever since I first came across the recipe in March, so I jumped on the opportunity when the temperatures dropped, and it was a fabulous match for my yellow squash and jalapeno spoonbread. I really enjoyed this soup. 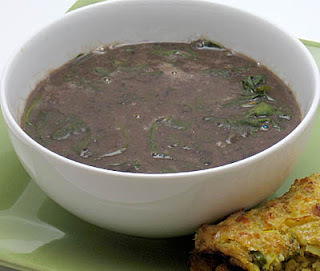 I'm always a fan of black bean soup, but I loved that the spinach cooked so much that it gave the soup a creamy texture. I even enjoyed a cold bowl of this the next day. Heat oil in a large pot over medium heat. Add the onion and saute until it's tender (about 5 min). Then add half of the garlic and the cumin, and cook an additional minute. 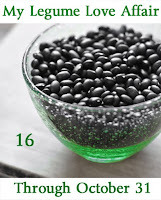 Stir in the beans and their soaking water, bring to a boil, reduce heat, cover, and simmer for an hour and a half. Puree it with an immersion blender (or blend about half of it in a regular blender), add the remaining ingredients (including the rest of the garlic), and continue to cook another 30 min. Serves 5. Things are certainly changing around here. It's crazy to think that a few short months ago I had strawberries coming out of my ears. It seems like decades ago, although I am transported back to spring every time I open my freezer. 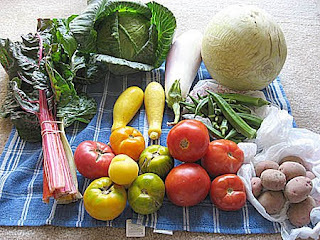 My last CSA share consisted of chard, cabbage, yellow squash, eggplant, okra, a melon, potatoes, and lots of tomatoes (both heirlooms and "regular"). The second I arrived to pick up my share, Amy informed me that there was okra and whispered, "you can take more than one basket." I love that they know my food obsessions :). I decided to only take a single basket because part of my mission in life is to spread the okra love. 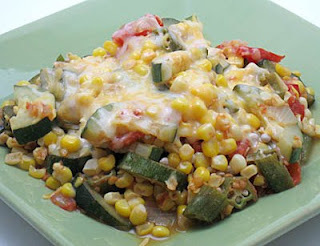 I sauteed it with a few tomatoes, corn, and zucchini. 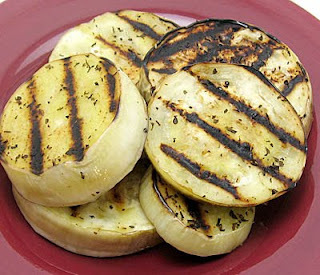 I'm pretty sure that there's nothing better than grilled eggplant, so of course that's what I did with mine. 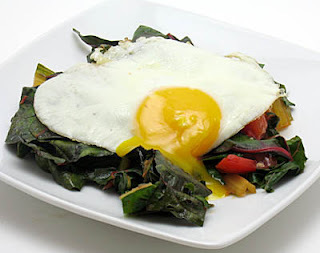 And, finally, I sauteed the chard with a tomato and topped it with a fried egg. It was a delicious and fast dinner! I'm trying not to think about the fact that my CSA will soon be over, but I'm excited that it's actually a week longer than I originally thought. I've become so spoiled this summer that it's going to be a difficult adjustment to shop for produce at the store. And who will encourage my love for weird, sometimes slimy vegetables?? I know that the tomatoes will soon be gone, but I'm trying to enjoy as many as I can before they disappear. I've been eating a ton of them in salads because, to me, a salad isn't really a salad unless it has delicious tomatoes on top. I also enjoy cooked tomatoes, but I never think to make them. While I was looking at the mix of heirloom and "non-heirloom" ("traditional"? "standard"?) tomatoes on my counter, I realized that I have never had broiled heirlooms. So, I mixed them together in an extremely simple broiled tomatoes dish. This was simple, but amazing. I love the way that the cooked tomato taste is completely different, but equally delicious. The tomatoes virtually melt in your mouth, too. I love the heirlooms and, as with raw ones, the green zebras were my favorites. The bit of cheese on top was the perfect complement, and this is an ideal accompaniment for just about any meal. Mix the cheese, salt, and pepper in a small bowl. 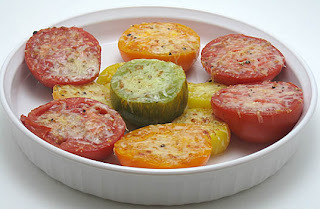 Place tomatoes in a baking dish and sprinkle the cheese mixture over them. Broil them (ideally on a rack about 6 inches away from the heating element) for about 5 min, or until the tops brown. Serves 4. From the time I was 10 until I left for college, I never had to go outside or check the weather to know that it was fall. As soon as the cooler temperatures arrived, my dog, Rascal, would run around and bounce all over the place. It was great entertainment, but unfortunately I haven't been home during fall in a long time (although I have a feeling that she's not as crazy as she once was, given that she's 15 now). But, I can relate. There's something about the crisp air and beautiful colors that slaps a silly grin on my face and gives me an extra boost of energy. I don't usually get to the point where I'm running around in circles, but it's tempting sometimes! However, I fear what follows falls. It's already getting colder than I like, and I have to keep reminding myself that this will be my last winter here. We had our first freeze on Wednesday night, and since then all I want to eat is bowl after bowl of soups, stews, and chilis. I thought it was only natural to make a soup from the cabbage and potatoes out of my CSA share. This might be my new favorite soup. It was delicious the first time, and got better and better over the next few days. It warmed me up and fills me up, which are my two most important soup characteristics. My sausage is fairly spicy, so it provided a lot of flavor for the soup. If you use a milder sausage (or no meat), you might want to season it a bit more. This will definitely be making an appearance for St. Patrick's Day, but I'm not sure that I can wait that long to have more. I'm seriously considering making it again this week. Brown the sausage over medium heat in a large pot. Add the leeks and cook until they soften (about 3 min). Add the garlic and cabbage and continue to cook until the cabbage begins to get tender (about 7 min), stirring occasionally. Add the remaining ingredients, bring to a boil, reduce heat, and let simmer for 45 min (or until the potatoes and carrots are very tender). Serves 4. I've been neglecting some of my favorite grains. Millet and quinoa - I'm extremely sorry that you haven't played much of a role in my life for the past couple of months. I've been eating so much local corn that I haven't had time for you. I've missed you, though, and I would like to welcome you back to my life if you're willing to give me another chance. Don't worry, you won't have to compete with any local grains until next summer. 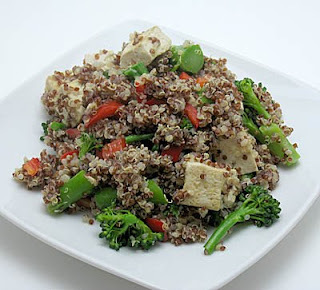 I made quinoa first, and used a recipe from "Vegetarian Planet" that combined quinoa with lemongrass, tofu, broccoli, and red peppers. This was a light, but quite filling dinner, and it was nice to have quinoa again. The texture contrasts were really cool - everything from the crunch of broccoli and peppers to the softness of tofu. I wish I would have marinated the tofu in something (perhaps a simple tamari, garlic, and ginger mixture) because that would have enhanced the flavors a bit. Even without this, though, I enjoyed it and won't mind eating the massive amounts of leftovers. Well, September is over, so I guess I'll have to wrap up my month of cooking from "Vegetarian Planet". By far, my favorite recipe was the masa cakes with salsa verde. Julia was right, these things are amazingly delicious (perhaps dangerously delicious). I also loved the smokin' black beans and eggplant and cherry tomato saute, and I'm sure that I will be making more of both. This quinoa was really good as well, but didn't knock my socks off as much as the rest did. I'm disappointed that I didn't get a chance to make more from the book this month, but I'm sure that I will be pulling it off the shelf very frequently. After trying more of the recipes, this book has quickly moved into one of my top 5 favorite cookbooks (don't ask me to rank them, though). Heat oil, garlic, and ginger over medium heat in a large skillet. After about a minute, add the lemongrass, Sichuan pepper, and tofu, and cook on medium-high heat, stirring frequently, for about 4 min. Add the broccoli and water, cover skillet, reduce heat to low, and let cook for 7 min. Then stir in bell pepper and quinoa and season with salt. Serves 5.